25 Near the cross of Jesus stood his mother, his mother’s sister, Mary the wife of Clopas, and Mary Magdalene. 27 and to the disciple, “Here is your mother.” From that time on, this disciple took her into his home. I love this painting, the look on Jesus’ face, as he blesses the child.I am intrigued as to what is going through the mind of the boy laid on the ground. What words is Jesus saying that make him appear spellbound. Now as we know in the time of Jesus weddings were week-long festivals. banquets would be prepared for many guests and the week would be spent celebrating the new life of the married couple. Often the whole town was invited and everyone would come. To accommodate many people careful planning was needed and to run out of wine was more than embarrassing: it broke the strong written laws of hospitality. Running out of wine brought shame, it says we don’t care about you, it insults the guests by saying you’ve already drunk too much, it says we are too poor to buy more. So what makes this wedding any different. When you look at the text it is actually Mary who is the key, John mentions Mary first and follows on that Jesus and his disciples were also guests. Mary’s presence takes precedence. So is Mary Key to this to this event. But as we know Mary it’s not put off by this and she orders the servants to do what ever Jesus tells them today. I want to take you back to to the Christmas story trying to Mary as young girl in a conversation with the angel. Mary is told.” He will be great and will be called a son of the most high. The Lord will give him the throne of his father David, and he will reign over the house of Jacob for ever: his kingdom will never end. Mary questions as to how this will happen she is told,the holy spirit will come upon you and the power of the most high will overshadow you. So the holy one to be born will be called the son of God. Mary has known all along that Jesus was born to be special. And perhaps she knows that this was actually the time for Jesus to actually show the person he was born to be the son of the most high. For Mary perhaps she may have expected it to be made clearer earlier who was especially after the episode and at this Jerusalem Temple when he was only 12, no doubt she had been waiting and wondering for this to happen for him to show his hand so to speak. To show the the messiah written about in Jewish texts was actually present as a guest at the wedding. The holy spirit had descended to Jesus and rested and stayed with him. This is the starting point of Jesus’s ministry after years of working as a carpenter. The prophesies had been fulfilled. As we say all things come about in Gods time. But did Mary expect a miracle, I don’t know, perhaps she was sure this was the time. Tradition says that Joseph was dead, so she properly was used to asking for her sons help in all situations. Something all mothers do!!! My son would defog say I do!!!! Jesus does eventually show his hand, in a big way. He doesn’t just go and find a couple of full wineskins from somewhere. No! He approaches the servants and instructs the servants to fill the six large ceremonial jars usually used for ritual washing to the brim with water. I should imagine that the servants were rather confused because the washing was long past. However, they did as Jesus said. Now as we know the ceremonial jars contains 20 to 30 gallons of water so the need for six would indicate a large gathering. So maybe an important family, the embarrassment of running out of wine would have been unthinkable. The water becomes wine, not just a mediocre wine, it was the best. Which in itself bought astonishment because at a wedding the best was served first and as time went on the quality of the wine would diminish. This miracle signalled change in order. It is often said of this passage that it Signals the beginning of a new era, which it does in more ways than one, because it signalled the start of Jesus’s ministry and the time when he would leave his home and Mary. He would no longer be there. Mary had to let go of her son, Jesus. He was not on this earth solely for her, he was and is here for us all if we want him. Is there something you are holding close that you need to let go of? Maybe God is asking you to do something, asking you to step out in faith that letting go will be ok.
New wine is a symbol for the coming of the kingdom, the new order, and in this new wine we are saved. This morning I went for a wander through the woods, no map, no compass, no satnav only the sun to tell me in which direction was south. With Epiphany coming, my wanderings made me think of the three Kings, they had only nature to aid their travel. The sun by day and stars by night, one particular star. They did what was expected of anyone, the tale was of the birth of a king so they went to a palace. Only to find they were in the wrong place, a king did live there but the one they were looking for. This king was threatened by the news that a new king had been born. So the King’s bid him farewell,but not before they had agreed to return and share where the new king was to be found. The King’s set of following the star, they had faith that they would find the King. In faith they found him,lying in a simple manger not in a golden crib in a palace. Do you follow the Star, what means of navigation do you use, your bible, your prayers. Thank goodness the kings took note of the dream they all had to return their home land by a different. Their faith shone through, does yours? And my walk, I got home safely and saw some beautiful sights which I share below. Advent reflections based on everyday objects. The keys we use every day unlock and lock our houses keep them and us safe. In prison the keys held by the wardens control the freedom of those locked inside. The “key to something” is the best or only way to achieve something. In the prophecy of Jeremiah 33:14-16 we hear how God will fulfil the promise made to Israel that they will be redeemed, that a new shoot will spring up, that the key to redemption and freedom is the justice and righteousness that Jesus will bring. In Luke 21:25-36 we are reminded that the Kingdom of God breaking through on earth will bring huge change, we should expect that change to come and expect God to act in the world. The key to change in the world is Jesus and his Kingdom. When you unlock your doors, pray that your heart will be unlocked to see the justice of Jesus at work in the world now. What can we do to live justly in the world today? When you lock your doors at night, pray for those who are not free and for those who are imprisoned. Come Lord Jesus. A phone means we can contact help when we need it. A phone helps us keep in touch with loved ones. A phone can send a message, a photo, a video and connect us to the rest of the world. In Malachi we hear that God’s messenger comes to prepare the way for the Lord’s arrival. We are reminded that when the Lord comes there will be consequences, his presence will purify and refine the world. The message in Luke is to get ready, to make our paths straight, to smooth out the rough bits, broadcast to the world that God is coming. What message about God might we be able to tell in our lives? How can we share something about Jesus with whoever we speak to regularly on the phone? What blessing or prayer could you write in a letter or Christmas card this year? Come Lord Jesus. When we turn on the tap fresh water gushes out. Water to wash in, to clean things, to satisfy our thirst, to refresh our gardens. Water sustains life. What sustains us? In Philippians we are reminded that instead of worrying we must pray. Connection with God through prayer sustains our Christian journey and refreshes us. In Luke we hear how John baptised with water, encouraging people to say sorry for all they have done wrong. Jesus will baptise us with the Holy Spirit: we are forgiven and receive new life in Christ. The Holy Spirit is God at work in our lives today. Pour a glass of water and give thanks for the clean water that we have access to. Pray for the whole world to have access to clean water. Drink the water and feel refreshed. Reflect on the things in your life you would like to be washed clean, say sorry for the things that are wrong. Drink again and know you are forgiven. What is God calling you to now? A towel dries us after a bath, wipes our hands in the kitchen, mops up spills and even wraps up a new born baby. Micah hints at the birth that is to come, the hard work and labour that will bring forth the shepherd for the flock. Luke reminds us of the Holy Spirit at work in both Elizabeth and Mary and the way God uses his lowly servant Mary to fulfil his plan to fill the hungry, to scatter the proud and redeem his people. For many people around the world a hot shower and a clean towel is just something to hope for. As we use our towel today pray for those who are longing for safety and security: Lord lift up the lowly. Think of a new born baby, wrapped securely in a towel and held tightly by his mother: the hope of new life is the hope that Jesus brings to his world. What do you hope for the world? Come, Lord Jesus. This morning I took an assembly at my local primary school, the subject was the festival of All Saints. I did a ppt talking about various saints. but it was the ensuing discussion on heaven and where it is. the answers ” in space” “amongst the clouds” ” the here and now” no one came up with the answer I thought may appear and that was a sweet shop !! But why not a sweet shop. We have many people in our lives who are or have been special to us. Life one big sweet shop, catering for all types of taste. Sadly some taste bitter, a bit like some people in life but some are sweet and enjoyable and become favourites. We welcome them with joy and each time we join with them we are happy and fullfilled. 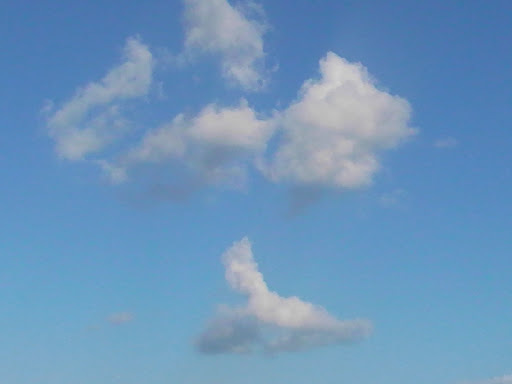 “In bed on a cloud” what a wonderful thought. I had this mental picture of all the saints in bed with name tags, just like the seven dwarfs. My mum and dad together, side by side. So what are you thoughts on heaven? James set out a warning !!! My sermon for today. I had an encounter with the devil this week, don’t be worried. He was crouched at the feet of a bishop in a stain glass window at St Andrews church in West Stafford, Dorset. 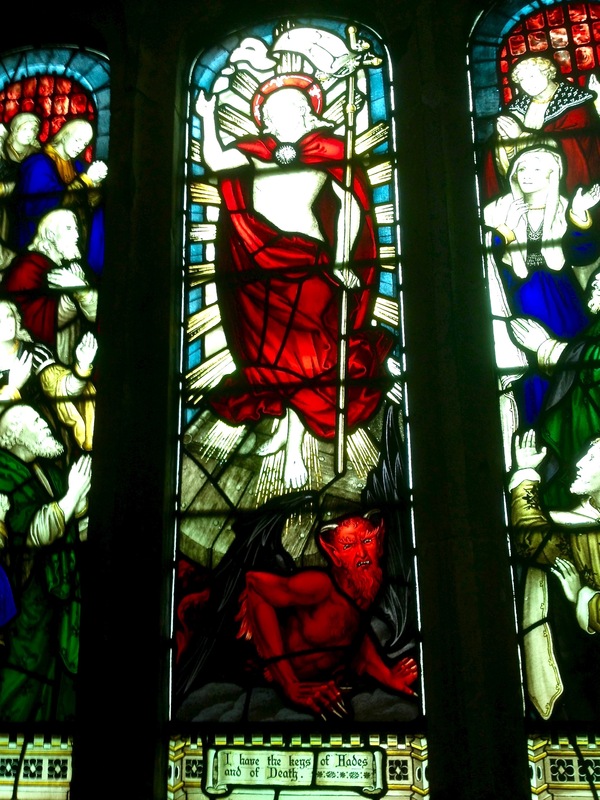 I think it was the first time I’ve actually seen the devil depicted in a stained glass window.It was most opportune as the epistle this morning talks about the devil. “But if you have bitter envy and selfish ambition in your hearts, do not be boastful and false to the truth. Such wisdom does not come down from above, but is earthly, unspiritual, devilish. For where there is envy and selfish ambition, there will also be disorder and wickedness of every kind. And in the gospel this morning we hear of to disciples arguing with one another as to who was the greatest. Not really an attribute that Jesus would expect to hear from one of his disciples. Would James consider they were thinking in earthly terms and not in heavenly terms, I think so So does the devil exist., is the devil trying to come between us and our faith. C.S Lewis wrote about the Devil in his humorous fiction ‘The Screwtape Letters’.These letters consist of imaginary letters from a senior devil to a junior devil, instructing him how to tempt a young man away from Christianity. Eventually they fail, and are consumed with wrath as their intended victim passes triumphantly into heaven. But in the course of the book we learn about what we’re up against if we wish to remain strong in our face and resist the call of atheism. It is a hilariously funny book yet; like all best humour it makes a serious point. Many of its readers have laughed at the jokes but have they ever ask themselves whether they believe that the devil exists or not. Some Christians will dismiss the question as decided already. Jesus believed in devils they answer, so we have no right to do disagree with him. They point to passages in Matthews Gospel, where Jesus meets to men that are possessed by demons and begins the task of casting them out. The Bible tells us that Jesus spoke to the Demons, even if it was only one word GO !! This proves some say that devils are real. But others will reply there is no scientific proof that Demons exist. Whereas it has been shown over and over again and when identical symptoms to those of the so-called demoniacs are treated as a physical physiological illness they can be killed. If Jesus had said, you are suffering from a psychosomatic illness nobody would have understood. Whereas if he used the language and terminology which the patient knew it will be effective in ridding him of his belief that he was incurable and allow the idea that God loved him to have its therapeutic effect. In the forward of ‘The Screwtape letters’ Lewis said that if asked whether he believed in the devil, with a capital D, he would reply No if you meant a, power opposite and equal to God existing in its own right from eternity. ‘God has no opposites’ he wrote. But he did believe that some angels had rejected God, and become his enemies. It is quite proper to call these fallen Angels Devils with a smaller D. But Satan their leader is the opposite of the Archangel Michael, not of God.This belief is not essential to his faith, wrote CS Lewis, but he will hold to it until someone can prove it to be untrue – and it is much harder to prove that anything does not exist than to prove it does. James remind us in v17-18 that the wisdom we need comes from above. ‘Submit yourselves therefore to God. Resist the devil, and he will flee from you. Draw near to God, and he will draw near to you. Cleanse your hands, you sinners, and purify your hearts, you double-minded’. We need to be on our guard for the devil slips in so quietly and we allow it by thinking of earthly matters and no heavenly matters. Format GalleryPosted on September 20, 2015 September 20, 2015 Categories Christian, dorset, FAITH, GOD, NEW TESTAMENTTags BIBLE, CHRISTIANLeave a comment on James set out a warning !!! My sermon for today. Hallelujah! You who serve God, praise God! Just to speak his name is praise! Just to remember God is a blessing— now and tomorrow and always. From east to west, from dawn to dusk, keep lifting all your praises to God! 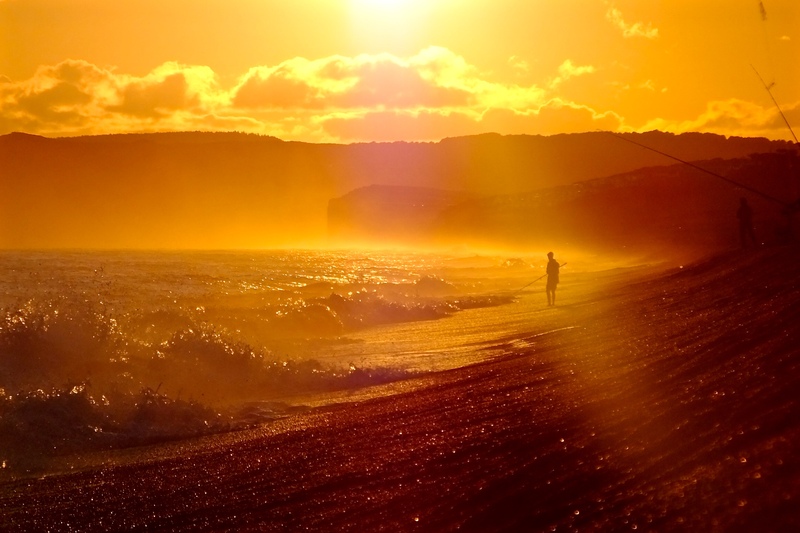 This photo shows a beautiful golden summer sunset shining on the Chesil beach, which forms part of the Unesco World Heritage Coast. I particularly like the way the sun flare accentuates the silhouette of the fisherman and catches the crest of the breaking waves. Posted on July 26, 2015 July 26, 2015 Categories BIBLE, Christian, dorset, UNESCOTags BIBLE, chesil bank., Dorset, photograpy2 Comments on Sunset Shoreline. 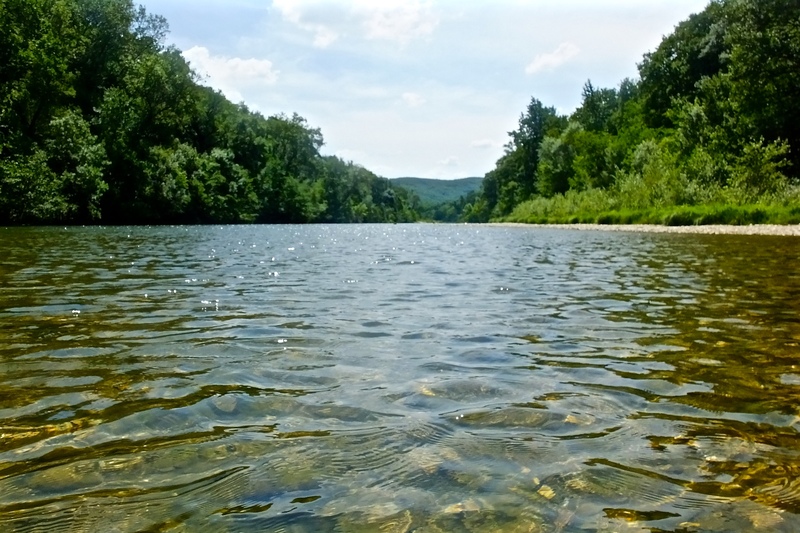 I sit in peace by the river,taking time to reflect on your world . And The the rustle of leaves as the wind gently blows. A world created for us out of love. A plane flies overhead, then is gone and silence returns. We, your chosen have made it imperfect. The knowledge you have gifted us had been used for good and evil. Man has moved from you in pursuit of their own needs and not the needs of other. Show us how you would have us put this right, enabling us to return to you. With peace of heart and mind, safe in the knowledge of your enduring love. To silence of mind, silence of heart safe in the knowledge that your love is enduring.